Back-Up™ Hinged Latent Print Lifters are a new design with several advantages over standard lifters for both the collecting officer at a crime scene and the examiner in the laboratory. First, Back-Up™ Lifters are identical to standard lifters; however, they come with either a white or black backing card affixed to the lifter, providing the background contrast needed to assure a good print has been collected. Second, the Back-Up™ backing cards are preprinted on the reverse side to help assure all pertinent information to the lifted print is recorded. 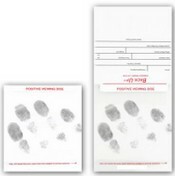 Third, Back-Up™ lifters allow the examiner in the lab to flip back the backing card and examine and photograph the lifted print using transmitted light (backlight) which provides maximum detail of the latent print. Back-Up™ Hinged Latent Print Lifters are available in four standard hinged lifter sizes: 1.5" x 2", 2" x 4", 4" x 4", and 6" x 9" for palm prints. All sizes are available with either white or black, .012" thick, high gloss finish backing cards.